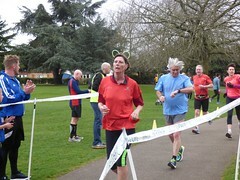 Daffodils, Easter chicks and bunny ears were the main feature of this week's run. 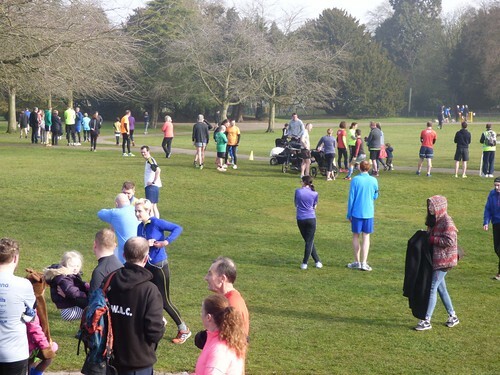 With plenty of our runners getting into the Easter spirit and showing once again that parkrun is all about having some fun, whilst enjoying a run with friends around a lovely park. With 50 first timers, (probably a record), the Spring has certainly inspired more of you to pop on your running shoes and join our regulars! This week, because of holidays, we had even more parkrun tourists than normal, with runners from Manchester, Colchester, Leeds, Ipswich, Oxford, Rutland, Bristol, Reading, Peterborough, Portsmouth, Market Harborough among others! Lovely to see you here in Lincoln. This week the enthusiastic team of volunteers cheering, timing, issuing tokens, scanning and all the other behind the scene jobs were Livia Banks, Emma Banks, John Berridge, Louise Budgen, Larissa Cowen, Sally Cox, Jim Davies, Wayne Dennett, Mark Dungworth, Rob Gilfoyle, Penny Hall, Cathy Holman, Amy Mackenzie, Sandra Purdy, Keith Rossiter, Consuela Sackfield, Joe Stables, Benjamin Thackray, Jack Thomas, Rosalind Treadwell, Judith Williams, Mark Williams. Our thanks go to them all. There are still spaces available for future weeks, please help if you can - check the rota first HERE. There was some excitement at the front of the field with first female Abbie Donnelly chasing down William Tucker in an attempt to be first overall finisher. After a big sprint finish William just held on at the line. Great running from you both well done. Close behind was Ivan Oxborough running as consistently as ever to finish third overall. The second female to finish was Cloe Hubbard. In total there were 357 finishers, (our 3rd highest turnout), with 62 achieving PBs. Full results can be found on the web site, click HERE. 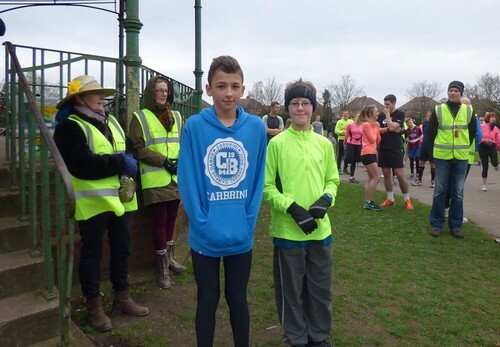 Two more Juniors were running their 10th parkrun to qualify for the junior 10 club. Congratulations go to Lewis Budgen (JM11-14) and Toby McNeil (JM11-14). See you in your new t-shirts soon! 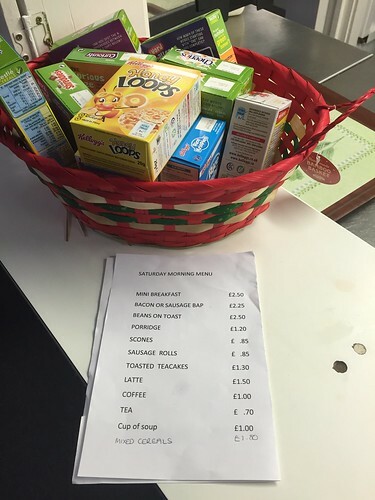 The familiar post run coffee and breakfast treats were in full flow at the bowls club again this week. With more new faces coming to join in, it is great to see how strong our parkrun community has become. 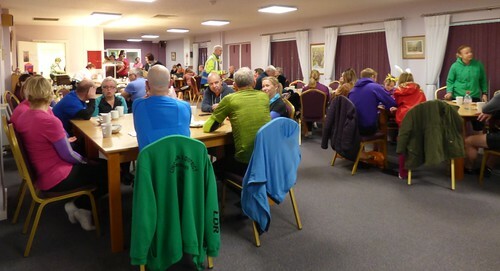 The friendly chat and banter between parkrunners just adds to the fun we all have each week. With it being Easter Wendy kindly treated the junior runners to some Easter eggs as a little bonus - much appreciated by them. A few of the adults were suddenly trying to look much younger - bad luck! Over 200 photos can be seen on the web site HERE. Huge thanks to Penny and Jack for providing so many different and interesting shots. Remember; if you take any pictures to add them to our Lincoln parkrun Flickr page for all to see. We were pleased to hear this week that Keith, our event director, has been persuaded to re-consider his plan to step down at the end of May. 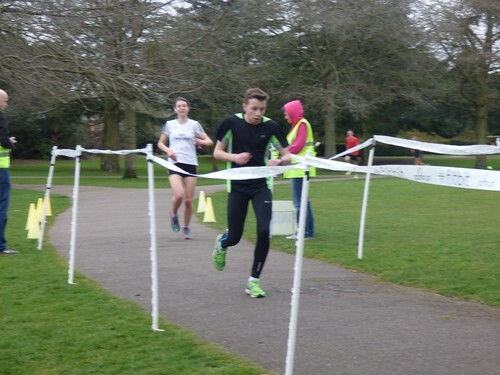 William TUCKER (JM15-17) of Grantham Athletic Club, was first over the line in 17:54 - first time in 3 appearances. Ivan OXBOROUGH (VM40-44) (Unattached) was second (third overall) over the line in 18:03 - was first to finish once before. Neil CONEY (VM45-49) of Lincoln Wellington AC, was third (4th overall) over the line in 18:23 - has been first to finish on 3 previous occasions. Abbie DONNELLY (SW18-19) of Lincoln Wellington AC, was first (second overall) over the line in 17:56 - 9th time in 9 appearances. Cloe HUBBARD (SW20-24) of Newark AC, was second (14th overall) over the line in 19:06. Niamh JACKSON (VW35-39) of Kirkstall Harriers, was third (30th overall) over the line in 20:23 - was first to finish once before. Abbie DONNELLY (SW18-19) was graded 82.81% for the time 17:56 (second overall). Neil CONEY (VM45-49) was graded 79.60% for the time 18:23 (4th overall). Steven MCCONNELL-WOOD (VM55-59) was graded 78.48% for the time 19:45 (23rd overall). This week there were 357 runners, of whom 50 were first timers and 62 recorded new Personal Bests. Representatives of 28 different athletics clubs took part. 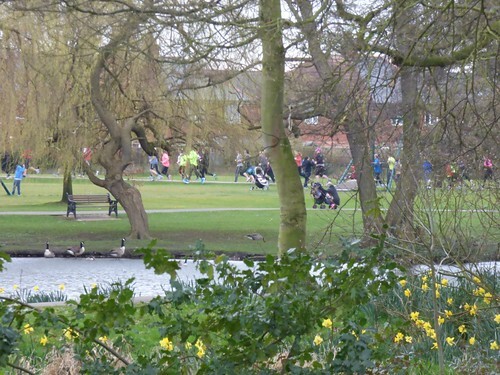 Lincoln parkrun started on 16th November 2013, and since then 4,229 different runners, including participants from 282 athletics clubs, have completed 28,237 runs covering a total distance of 141,185 km, and there have been 6,511 new Personal Bests. The female record is held by Sophie COWPER who ran in a time of 17:24 on 2015-08-15 (event number 85). The male record is held by Matthew BOWSER who ran in a time of 14:54 on 2014-05-24 (event number 26). The Age Grade course record is held by Peter DUNCAN who recorded a 87.55% run (17:24) on 1st August 2015 (event number 83). 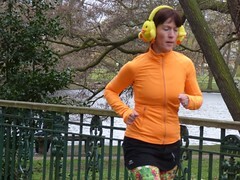 Next week is Easter parkrun Saturday so it's an excellent opportunity to be creative! 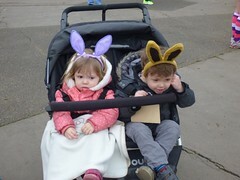 Easter bonnets and costumes are encouraged as our themed weeks are always really good fun. If you want to dress as an Easter bunny then go for it! We look forward to seeing your creations – can you beat Halloween? We are very fortunate to have our parkrun here in Lincoln. It is really popular with our regular runners of course, but we also welcome lots of first timers each week and many parkrun tourists too. 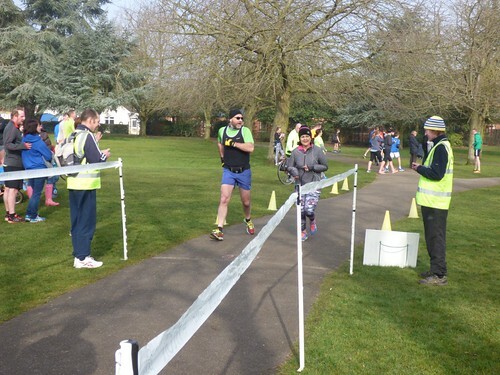 This week, Stu and Jane timed 368 finishers over the finish line, which included 37 first timers. For some, this was their first parkrun experience and from the smiles on their faces everyone seemed to enjoy it and rightly so! Runners included several parkrun tourists; it's great to meet tourists and to listen to their experiences of parkrun around the country. We welcomed runners from Woolwich, Bushy Park, Orpington, Brighton & Hove and Scunthorpe. Even though there were lots of local races taking place on Sunday, our runners still put everything into their weekly 5k run, achieving a massive 100 personal bests (PBs) between them. Touring parkrunner Caroline Wood, from Brighton, led the ladies in with a time of 19:53 to set a new age group course record, well done Caroline! Closely following was Anna Tuffs who ran a personal best of 19:57. Congratulations on your first sub 20 finish! For the mens it was Peter Duncan showing everyone the way home in 17:40 to mark another impressive 86.98% age grading! Close behind was last week's first finisher, Carl Bell, just short of his PB. The full set of results can be found by clicking here. 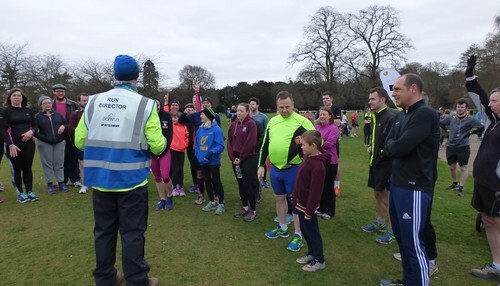 parkrun is brought to you each week by a team of volunteers; the majority being regular runners themselves, which makes for a friendly and encouraging atmosphere. So many runners have joined our teams, so thank you to each and everyone who has ever volunteered. We're always looking for volunteers so please consider helping sometimes and experience parkrun from the other side it never fails to amaze! Click here to have a look at the future rosters and let us know when you can help out. We had a huge team of volunteers this week doing a fantastic job. Our thanks go to Carl STANHAM – marshal • Chris WOOD – marshal • Consuela SACKFIELD – marshal • David ROLLINGS - marshal • Ellie DENNETT - barcode scanning • Emma BANKS – marshal • Gary LESLIE - barcode scanning • Jane CHARLESWORTH - timekeeper • Jo GIBBON - tail runner • John BERRIDGE - marshal • Judith WILLIAMS - marshal • Kristie HOLROYD - Finish tokens • Livia BANKS - marshal • Louisa DENNETT - Run Director • Louise BUDGEN - barcode scanning • Mark NIND - barcode scanning • Mark STEPHENSON - funnel manager • Mark WILLIAMS - marshal • Nathan ADDLESEE - marshal • Sally IRONMONGER - finish token support • Sandra PURDY - marshal • Stu BLISSITT - timekeeper • Wayne DENNETT - number checker and photographer. You all helped make parkrun happen - thank you! Joseph Davies (JW10) was excited to be completing his 50th parkrun this week along with Nicki Powell (VM40-44), also running her 50th.. They will soon be ordering their red 50 Club t-shirt, keep a watch on your profile for notification of when you can place your order. It's great to see more and more of Red 50 and Black 100 t-shirts being used each week. These are a real sign of dedication and love for parkrun - also a great achievement. We were pleased that all the finish tokens were returned this week – thank you, keep it up! With 368 used there was a lot of sorting to be done in the bowls club. Our thanks also go to Mark Stephenson visiting from Brighton & Hove who offered to help manage the action in the finish funnel and congratulate each finisher too. Your help was much appreciated! The post run refreshment at the Bowls Club has become a big part of the parkrun experience for so many. 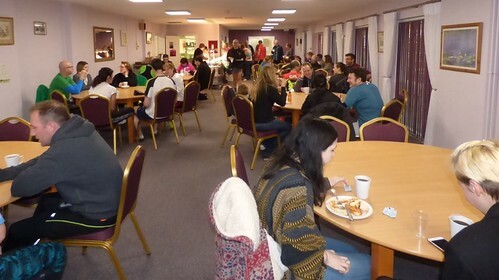 This week was no exception with lots of runners keen to refuel and have a friendly chat over a coffee or breakfast. It really has helped create the friendly community that we are so proud of. There is always a lovely atmosphere with lots of room for everyone! The more of you who come the better, it’s a great place to get to know people and make friends. If you are not sure about trying it, take a look at this week’s menu, it is fantastic value! Peter DUNCAN (VM55-59) of Lincoln Wellington AC, was first over the line in 17:40 - 4th time in 25 appearances. Carl BELL (JM15-17) of Lincoln and District Runners, was second over the line in 17:56 - has been first to finish on 2 previous occasions. Ivan OXBOROUGH (VM40-44) (Unattached) was third over the line in 18:01 - was first to finish once before. 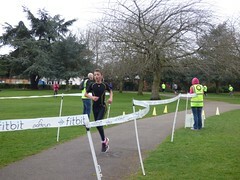 Caroline WOOD (VW50-54) of Arena 80 AC, was first (18th overall) over the line in 19:53 - first appearance. Anna TUFFS (SW20-24) (Unattached) was second (20th overall) over the line in 19:57 - has been first to finish on 4 previous occasions. Lauren KITCHEN (SW20-24) (Unattached) was third (26th overall) over the line in 20:50. Peter DUNCAN (VM55-59) was graded 86.98% for the time 17:40 (first overall). Caroline WOOD (VW50-54) was graded 86.42% for the time 19:53 (18th overall). Neil CONEY (VM45-49) was graded 79.82% for the time 18:20 (5th overall). 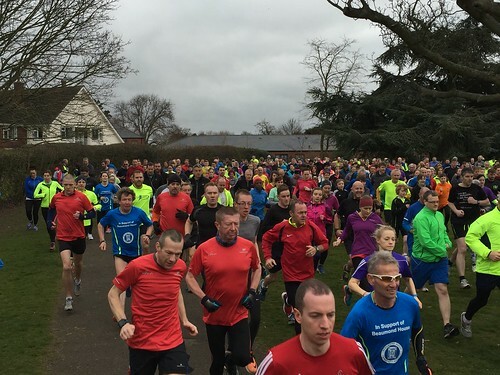 This week there were 368 runners, of whom 37 were first timers and 100 recorded new Personal Bests. Representatives of 18 different athletics clubs took part. Lincoln parkrun started on 16th November 2013, and since then 4,179 different runners, including participants from 277 athletics clubs, have completed 27,880 runs covering a total distance of 139,400 km, and there have been 6,449 new Personal Bests. The Age Grade course record is held by Peter DUNCAN who recorded an 87.55% run (17:24) on 1st August 2015 (event number 83). Today's full results and a complete event history can be found on the Lincoln parkrun Results Page. 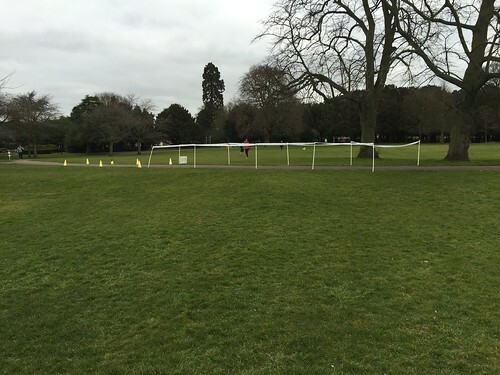 Event 115 at Lincoln parkrun was blessed with very settled conditions. Days like this have been well earned after the weeks when we have endured torrential rain and gale force winds. Although there was a definite chill in the air as the volunteers began to arrive for duty, the park was soon glowing in bright spring sunshine. 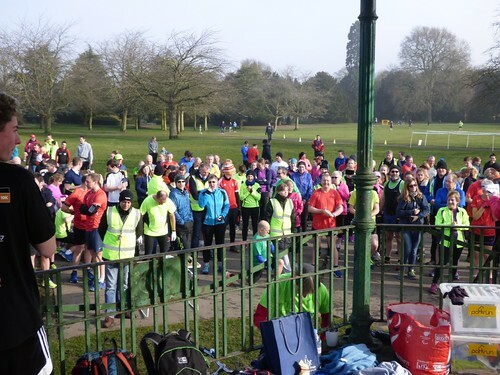 The morning began, as it always does, with runners, volunteers and spectators meeting by the bandstand, eagerly awaiting those all important words, 'Let's run'. The main runners briefing takes place just before 9am every Saturday with a new runners briefing at 8:50am. Both are equally important as safety messages are issued and special events are celebrated. 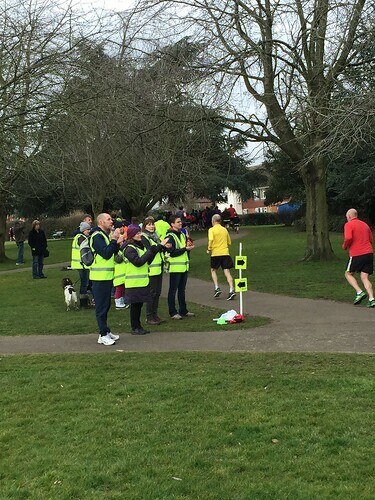 Celebrations and achievements continued as we thanked Dean Houlton for his 'services to parkrun!' Dean was volunteering for his 50th time and everyone joined together in a huge applause to show their appreciation. Dean was timekeeping alongside Stu and did a marvellous job in his part of the finish team - thanks again Dean! Here at Lincoln, we are very proud of parkrun and it's always a pleasure to welcome ALL runners to our event. We are here for everyone. 317 runners crossed the finish line including 29 first timers this week and the feedback we received is that they'll be back and we'll be very pleased to see you! There was some fantastic running on display. 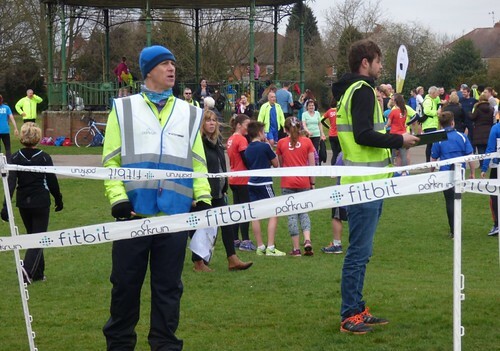 parkrun is a run not a race and this is what makes parkrun so unique. Of course, personal bests are a reward for a great run and this week, a phenomenal 81 were recorded. Well done everyone, there were plenty of 'flying feet' proving that you all definitely had a 'spring' in your step. Take a look at the many action shots by clicking here along with lots of other photos too. It's great to see so many runners encouraging others. There is no wonder so many friendships have formed through parkrun. The park was full of people chatting after their run. We are very fortunate to have the support of the Bowls Club. If you haven't popped over for coffee and breakfast yet, please join us soon! It's such a lovely way of extending your weekly parkrun experience. Everyone involved in bringing the event to Lincoln is a volunteer. If you would like to offer us a helping hand, then please do let us know. Have you opted in to the volunteer e-mail yet? This does not mean you have to volunteer every week, it simply means we can keep in touch with you. Rosters are always available on the website and we can update them months in advance. So, if you know a date when you are available, please let us know by e-mailing lincolnhelpers@parkrun.com You too could be one of our hi-viz heroes! Volunteer rosters can be found in the volunteer section of the Lincoln parkrun website. *****Unfortunately, we have lost three tokens that mysteriously escaped this week***** Please spread the word and if you, or anyone you know has these tokens, please return them to us. We need a full kit box each week and these precious little tokens (that are the property of parkrun) are really important. We are missing 198, 234 and 235. As the marshals gathered in the course signs and the results processors began work on the results, thoughts were already in motion for event 116. See you then! Carl BELL (JM15-17) of Lincoln and District Runners, was first over the line in 17:50 - second time in 47 appearances. Robert HODGKISON (JM15-17) (Unattached) was second over the line in 17:52. James BODY (SM20-24) (Unattached) was third over the line in 17:53. Anna TUFFS (SW20-24) (Unattached) was first (17th overall) over the line in 20:24 - 4th time in 13 appearances. Lauren KITCHEN (SW20-24) (Unattached) was second (25th overall) over the line in 21:02. Natalie BOWN (SW25-29) (Unattached) was third (29th overall) over the line in 21:22 - has been first to finish on 3 previous occasions. Neil CONEY (VM45-49) was graded 80.18% for the time 18:15 (5th overall). Joseph GREEN (JM11-14) was graded 77.72% for the time 18:15 (6th overall). Richard TITCHMARSH (VM70-74) was graded 76.83% for the time 23:53 (75th overall). This week there were 317 runners, of whom 29 were first timers and 81 recorded new Personal Bests. Representatives of 11 different athletics clubs took part. 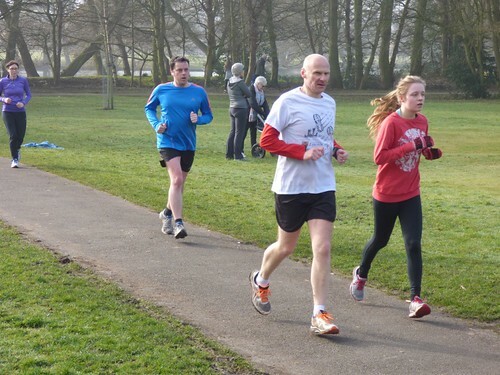 Lincoln parkrun started on 16th November 2013, and since then 4,142 different runners, including participants from 278 athletics clubs, have completed 27,512 runs covering a total distance of 137,560 km, and there have been 6,349 new Personal Bests. The female record is held by Sophie COWPER who ran in a time of 00:17:24 on 2015-08-15 (event number 85). The male record is held by Matthew BOWSER who ran in a time of 00:14:54 on 2014-05-24 (event number 26). Congratulations to John Nott who was celebrating his 18th birthday and enjoying his very last parkrun as a junior with lots of his family & friends. 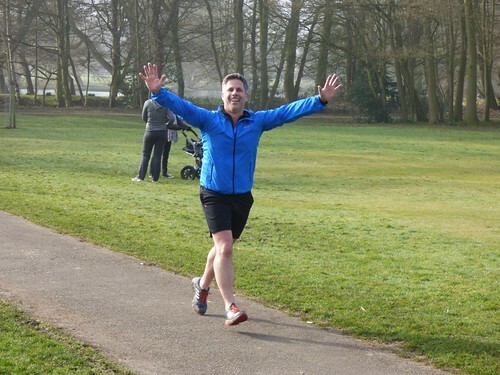 John is a popular and well know runner, who has been coming to Lincoln parkrun since the start. He was the first to receive a parkrun t-shirt way back in November 2013 and has managed to run almost every week wherever he has been on a Saturday morning. 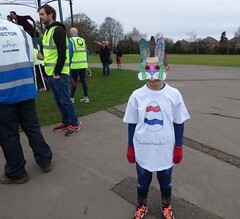 He has now clocked up 115 parkruns, which is some record for a Junior. Well done John, that 250 t-shirt is getting closer! Tommy George was having a double celebration with it being his birthday and then running a massive new PB to mark the occasion. How did we know it was your birthday, well we have spies everywhere! We think some thanks also go to Wayne Lathwell for his pacing support, well done to you both. Thanks to our volunteers comes in many different ways. This week there was a special thank you in the form of a home made card from James & Lewis Budgen. We think the message says everything needed for our brilliant volunteers. Thank you boys and thank you volunteers. The team helping this week were - Amanda KONRATH • Betty STRACEY • Catherine FRANKLIN • Catherine LORD • Colette LONGSTAFFE • Consuela SACKFIELD • Dean HOULTON • Ivan OXBOROUGH • Jim ARAM • John BERRIDGE • Keith ROSSITER • Louisa DENNETT • Louise BUDGEN • Michael NOTT • Nicola MAYO • Penny HALL • Phil HALSTEAD • Rasmus GYLTNES • Stu BLISSITT. This is an example of the roster, click HERE for the up to date position and let us know if would like to help out sometime over the next few weeks. This week the tourist list included parkrunners from around the country again, including Sheffield, Oxford, Brandon, Nottingham, Swansea, Chester. Great to see you all here in Lincoln, we’d love to see you another time. Carl Bell was first over the line - first time in 46 appearances this week, also setting another PB in 18:05. Sophie Darling was the first Female to finish in 20:23 making it her 13th first finish here in Lincoln. Continuing the celebration theme of the weekend, we had some more regular parkrunners achieving notable milestones. 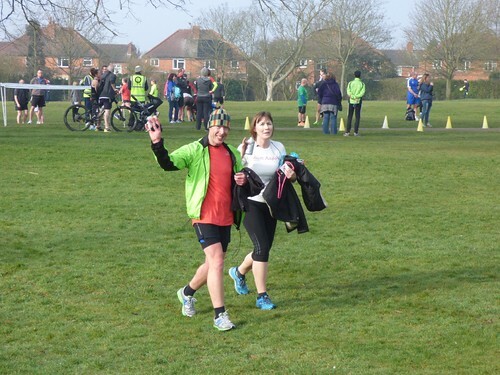 Connie Sackfield was volunteering as this week’s tail runner, (making sure everyone got back to the finish), and completing her 100th parkrun. Connie is another great supporter of Lincoln parkrun having been involved right from the first test event in 2013. Joining the 50 club this week were Ian Kirk, Emma Krasinska and Lucy Davies. Lucy is another of our junior runners joining the 50 club having run every one of her 50 parkruns here in Lincoln. Well done to you all. 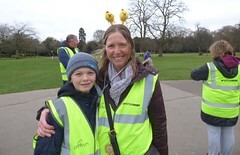 Lewis Foster completed his 10th parkrun to become the latest member of the junior 10 Club. Supported on the day by his Mum Michelle who was resting ready for her own race on Sunday. 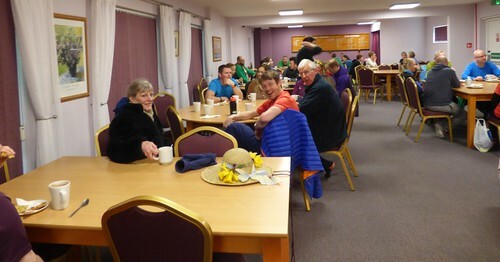 Lots of runners were pleased the bowls club was open again after a week off and quickly made their way over for some well earned refreshment, those breakfasts have become very popular! Please take a look at all the photographs on the Lincoln parkrun Flickr pages, there are so many this week, giving a good chance you will feature. Click HERE to see the Lincoln group. 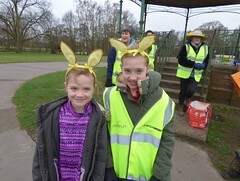 Easter is coming We will be having an Easter themed run on Easter Saturday, (26th March), so start thinking about your Easter Bonnets, chick costumes or whatever you fancy, parkrun is fun and our theme days are really catching on. Carl BELL (JM15-17) of Lincoln and District Runners, was first over the line in 18:05 - first time in 46 appearances. Ivan OXBOROUGH (VM40-44) (Unattached) was second over the line in 18:22 - was first to finish once before. Thomas GEORGE (SM20-24) (Unattached) was third over the line in 18:27. Sophie DARLING (SW20-24) of Lincoln Wellington AC, was first (21st overall) over the line in 20:23 - 13th time in 25 appearances. Anna TUFFS (SW20-24) (Unattached) was second (25th overall) over the line in 20:43 - has been first to finish on 3 previous occasions. Lauren KITCHEN (SW20-24) (Unattached) was third (33rd overall) over the line in 21:14. Neil CONEY (VM45-49) was graded 77.98% for the time 18:46 (8th overall). Betty STRACEY (VW75-79) was graded 77.46% for the time 31:52 (230th overall). Richard TITCHMARSH (VM70-74) was graded 77.32% for the time 23:44 (79th overall). This week there were 310 runners, of whom 27 were first timers and 61 recorded new Personal Bests. Representatives of 19 different athletics clubs took part. 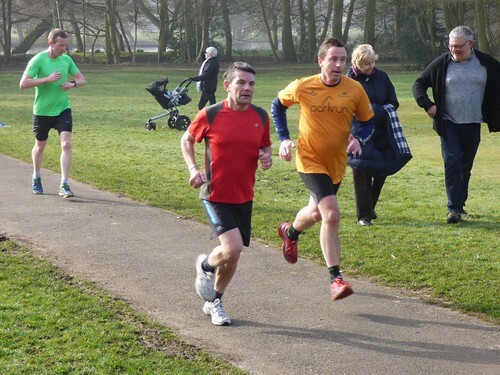 Lincoln parkrun started on 16th November 2013, and since then 4,113 different runners, including participants from 277 athletics clubs, have completed 27,195 runs covering a total distance of 135,975 km, and there have been 6,268 new Personal Bests.